Authored by Dean Babb, MMAO(4) Chesterfield Township, Macomb County. Adapted with permission for wide distribution. Prior to Proposal A, property taxes were based upon state equalized value (SEV). With the implementation of Proposal A, property taxes are now based upon taxable value. Each year, the Assessing Department must calculate the SEV for every property based upon the period as outlined by the State Tax Commission. A property’s taxable status is determined as of December 31, which is called Tax Day. Additionally, each property has a capped value. Capped value is calculated by multiplying the prior year’s taxable value, with adjustments for additions or losses, by the CPI as calculated by the State of Michigan and cannot increase more than 5 percent. For 2019, the CPI has been calculated at 2.4 percent. 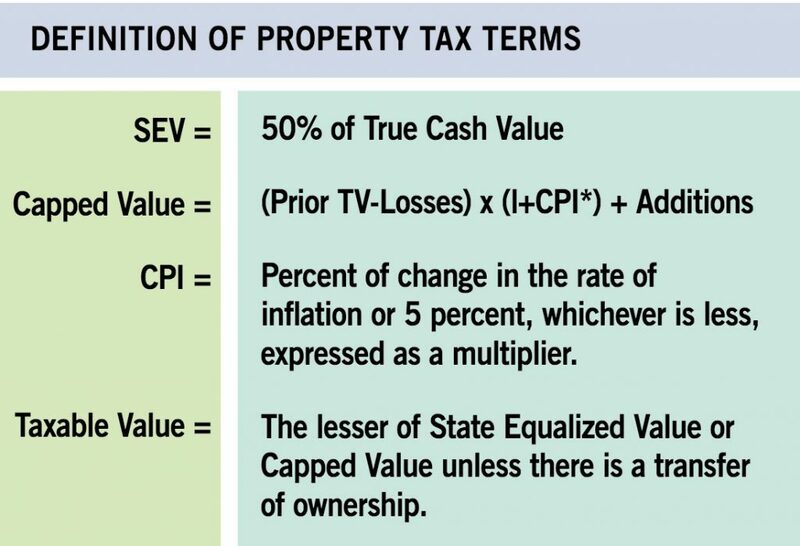 Taxable value, which property taxes are based on, is defined as the lower of SEV or capped value. Generally speaking, this means that unless the current year’s SEV is less than the previous year’s taxable value multiplied by the CPI, the current year’s taxable value will increase by the CPI. With the recovery in market values, the State Tax Commission has mandated local assessors again use a 24-month sales study to determine values for the 2019 assessment cycle. They have pushed back the period of the study from prior years. For assessments, the 24-month sales study began April 1, 2016 and ends March 31, 2018. The law defines true cash value as the usual selling price of a property. The legislature and the courts have very clearly stated that the actual selling price of a property is not a controlling factor in the true cash value of SEV as calculated by the assessor. For this reason, when analyzing sales for determining assessment changes, the Assessing Department will review all sales but exclude non-representative sales from the assessment analysis. According to Proposal A, when a property (or interest in a property) is transferred, the following year’s SEV becomes that year’s taxable value. In other words, if you purchased a property in 2018, the taxable value for 2019 will be the same as the 2019 SEV. The taxable value will then be “capped” again in the second year following the transfer of ownership. It is the responsibility of the buyer in the transfer to file a property transfer affidavit within 45 days of the transfer. This form helps the Assessing Department determine whether the nature of the transfer indicates the taxable value should be uncapped for the subsequent year. If this form is not filed, the Assessing Department must assume taxable value should be uncapped. Property transfer affidavits are available from the Assessing Department as well as the Township website. Again, it is important to note that a property does not uncap to the selling price, but to the SEV in the year following the transfer of ownership. If you own and occupy your home as your principal residence, it may be exempt from a portion of local school operating taxes. You may check your percentage of principal residence exemption on your “Notice of Assessment.” If the percentage exempt as “Principal Residence” is zero percent on your assessment notice and you wish to claim an exemption for the current year, a principal residence exemption affidavit must be completed and turned into the Assessing Department prior to November 1. Furthermore, if you currently have a principal residence exemption on your property and you no longer own and occupy the property as your primary residence, you must rescind the principal residence exemption with the Assessing Department. Department staff also conduct year-round audits of principal residence exemptions to verify eligibility requirements are met. How Can I Expect My Assessment and Taxable Value to Change In 2019? As stated earlier, for 2019 the time period of the sales study for assessment review is April 1, 2016 through March 31, 2018. Sales occurring after April 1, 2018 will not be reviewed until the 2020 assessment cycle. Using the current sales data means that most areas will have increases reflecting the strong recovery in the real estate market. Properties where the market increase is greater than 2.4 percent will have taxable values lower than their assessed values. For some properties that gap is significant. How Can My Taxable Value Go Up When My SEV Goes Down? With the recovery in the real estate market, this is now rare but may occasionally happen. Remember, the definition of taxable value is the lesser of SEV or last year’s taxable value (adjusted for physical changes) times the CPI (2.4 percent for 2019). Since the beginning of Proposal A in 1994, overall increases in SEV have generally been greater than the increase in taxable value capped at the CPI. The longer a property has been owned and capped, the greater the gap between SEV and taxable value. Even with a decrease in SEV for 2019, if there is still a gap between SEV and taxable value and the 2019 SEV is greater than the taxable value in the previous year, the taxable value will increase to the limit of the CPI cap. If, however, the 2019 SEV is lower than the calculation of last year’s taxable value multiplied by the CPI, then the 2019 taxable value will be the same as the 2019 SEV. For further information, refer to the Delhi Charter Township website, www.delhitownship.com, or contact the Delhi Township Assessing Department, 2074 Aurelius Road, Holt, Michigan 48842, 517.694.1502.